Fetal growth restriction (FGR) or IUGR has been defined as a fetal weight which is less than 10% of the predicted weight for the gestational age. Although the usual definition of FGR mentions a fetal birth weight less than the 10th percentile, studies have found that about a quarter of the infants under the 10th percentile have a normal birth weight (i.e. they are constitutionally small, also called small for gestational age) after corrections are applied for low weight of the mother, physical characteristics of the father and residing at high altitudes. 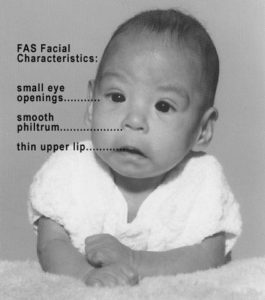 To avoid various confounding factors, local and national fetal growth graphs are adapted to determine FGR. The incidence of neonatal FGR is approximately 3 – 7% of the total population. The condition affects 60% of the 4 million neonatal deaths associated with low birth weight due to IUGR. The incidence of neonatal FGR is approximately 3 – 7% of the total population. The most common type is the asymmetrical IUGR representing more than 70% of the cases while the symmetrical variant represents 20 – 25% of the cases. Alcohol dependency in the first trimester is associated with fetal alcohol syndrome, while, in the second and third trimester, alcohol intake as less as two drinks per day is associated with FGR. Cocaine dependency can result in FGR with a reduced fetal head circumference. Smoking: In the United States, smoking has been reported to be responsible for up to 40% of FGR cases. Infections: TORCHES complex that includes Toxoplasma, Rubella, cytomegalovirus, herpes 1, herpes 2, HIV and, syphilis. Medical co-morbidities: chronic hypertension, pre-eclampsia in early pregnancy, diabetes mellitus, systemic lupus erythematosus, chronic renal disease, and severe pulmonary disease. These conditions cause uteroplacental insufficiency. Chronic hypertension is one of the commonest causes of FGR. Neonates with FGR born to hypertensive mothers have a higher incidence of perinatal mortality compared to neonates with FGR born to normotensive mothers. Multiple gestations are associated with a higher incidence of FGR than single gestation due to placental overcrowding, poor implantation of the placenta and twin–to–twin transfusion. FGR is classified as symmetric and asymmetric. Symmetric/primary FGR is defined as a poor growth rate of the fetal head, as well as the abdomen and the long bones; thus, all internal organs are reduced in size. Asymmetric FGR is defined as an unequal growth rate of the fetal head and the long bones versus the abdomen and the viscera. It is defined as the unequal restriction of weight followed by length. There are head and brain sparing allowing it to grow to normal levels. It is mostly due to extrinsic factors that occur in late pregnancy. The current opinion is that there is asymmetrical FGR in the early stages followed by symmetrical FGR in the later stages of the gestation. Often, there are no signs and symptoms of FGR. Occasionally, the pregnant woman may complain of the sensation that her baby is not as big as it should be. FGR may be clinically suspected if the size of the uterus in a pregnant woman is small for gestational age or if third-trimester weight gain is less than expected (3.5 to 7oz per week) or detected incidentally on ultrasound. This is evaluated by measuring the distance between the fundus of the uterus and the pubic bone of the pregnant woman. A 4 cm or greater lag in fundal height for gestational age is considered significant. Precise dating of the gestation with an ultrasound between the 8th to 13th week of gestation is used to detect FGR later in the pregnancy. However, accurate dating is difficult as the gestation progresses. 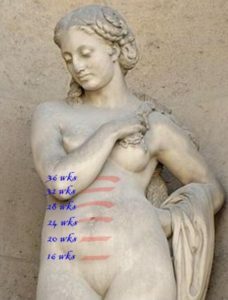 Fetal weight, head circumference and abdominal circumference measurements plotted against pre-existing standardized charts help to diagnose FGR. Usually, an ultrasound at 18 – 20 weeks of gestation is used to date the pregnancy and rule out any congenital malformations. Later, the findings are compared to another scan done at 28 – 32 weeks of gestation to assess growth, symmetry, and brain physiology. <6th percentile indicates FGR, while fetal weight >20th percentile excludes FGR. Serial ultrasound measurements showing a decrease in fetal weight or estimated fetal weight at or <15th percentile is suggestive of FGR. It is the first parameter to get affected in FGR resulting in an increase of the ratio of the head circumference to the abdominal circumference. The normal ratio is one between 32 – 34 weeks and decreases to less than one after 34 weeks. A ratio of >1 is suggestive of FGR. To calculate the amniotic fluid index (AFI), the amniotic fluid volume is measured in the deepest, vertical pocket of each quadrant and then the measurements of the four pockets are added together. Normal AFI ranges from 5 – 25 cm. Oligohydramnios is noticed in a majority of the infants with FGR. The risk of FGR increases when the AFI is < 5cm. The peak systolic and diastolic pressure of the umbilical arterial blood flow is measured using ultrasound Doppler velocimetry. The systolic/diastolic ratio is calculated by averaging the results. An increased ratio is suggestive of FGR in 80% of cases. Once FGR is detected, the etiology for the condition is determined with a series of maternal laboratory tests such as complete blood count, peripheral smear, platelet count, chemistry panel, and TORCH titers as well as other infections, if not already done. Amniocentesis may also be required to detect genetic anomalies. 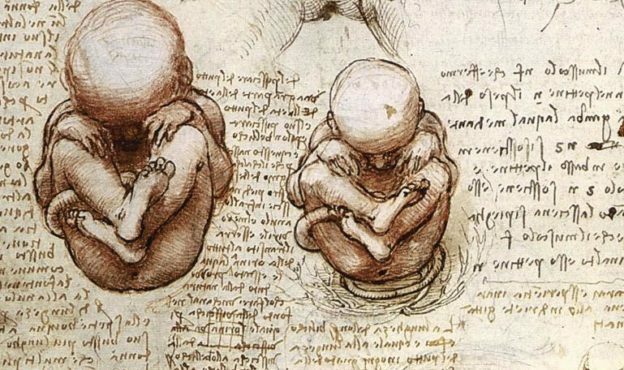 A majority of the fetal deaths due to FGR occur between 36 weeks of gestation and the onset of labor; therefore, the clinician should consider the gestational age at diagnosis of FGR and has to plan the delivery date earlier if there is developing evidence of fetal compromise. Serial ultrasound examination at 3 – 4 weekly intervals with estimation of fetal weight, AFI, head circumference and abdominal circumference is essential. If the head circumference remains the same over a period of a month, then prompt delivery of the fetus may be indicated. Non-stress testing (NST) twice weekly is also performed in suspected cases of FGR. Oligohydramnios is indicated by spontaneous variable decelerations of fetal heart rate on the NST, while fetal hypoxemia is indicated by a non-reactive NST. Follow-up testing with contraction stress test or a biophysical profile is required if NST is suggestive of fetal hypoxemia. NST, fetal tone, AFI, fetal breathing and gross body movements all constitute the biophysical profile which predicts the well-being of the fetus, fetal distress and perinatal mortality. Infants with FGR have a higher incidence of meconium aspiration, intrapartum asphyxia and low Apgar scores; therefore, intrapartum monitoring of the fetal heart rate is required while amnioinfusion in presence of Oligohydramnios should be considered. Prompt delivery or cesarean section is indicated if there are late decelerations suggestive of fetal hypoxemia. It is important to exclude hypoglycemia, hypocalcemia, hypothermia and polycythemia (due to hypoxia) in newborns with FGR and promptly manage the condition/s. A majority of infants with FGR have a good prognosis and often catch-up by growing in the first three months after birth attaining normal growth percentiles by the age of one year. Studies have reported late sequelae like hyperactivity, clumsiness, poor ability to concentrate with an elevated risk of developing hypertension, insulin dependent diabetes mellitus and obesity in children born with FGR.